DuncanPutman.com Blog: Win The 1,000,000th Peterbilt! Are You The Ultimate SuperFan? Win The 1,000,000th Peterbilt! Are You The Ultimate SuperFan? DENTON, Texas – October 26, 2017 – Peterbilt Motors Company will celebrate a significant milestone with the production of its 1,000,000th truck in mid-January 2018. “Since the early days of production in 1939, Peterbilt has been the preferred brand of drivers and owner operators built on a reputation of unrivaled quality and customer value. Today that customer preference has expanded to include medium and large fleets that appreciate not only the distinctive styling and driver preference but attributes such as low cost of ownership, integration of technology and class leading uptime and durability, all supported by a strong and extensive dealer network,” said Kyle Quinn, General Manager, Peterbilt Motors Company. 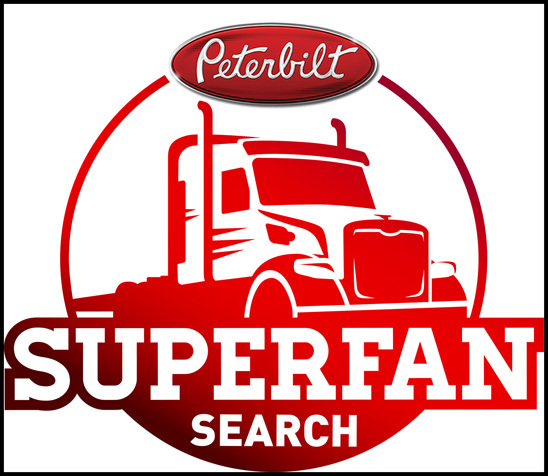 To commemorate this event, Peterbilt will celebrate by hosting a SuperFan campaign to identify the ultimate fan of the iconic brand. This extraordinary celebration of Peterbilt’s history and heritage will connect directly with thousands of Peterbilt drivers and fans and give them a platform to individually express the role that the brand has played in their lives. The Peterbilt SuperFan promotion will recognize five SuperFans through a promotional campaign culminating with a special presentation at the 2018 Mid America Trucking Show (MATS). One finalist will be selected as the top SuperFan and will be honored with the keys to the unique, 1,000,000th production unit, a Peterbilt Model 567 Heritage, fully customized to celebrate this remarkable milestone. Peterbilt is accepting submissions from fans throughout the United States and Canada via a dedicated website at www.Peterbilt.com/SuperFanSearch through December 22, 2017. People are encouraged to visit the website and submit their stories, videos and photos that show the passion that makes them a SuperFan. The five finalists will be selected just after the New Year. “The Peterbilt brand is built on loyalty, it is the lifeblood of our business. We want to reward that loyalty and the 1,000,000th truck milestone will be the perfect opportunity. We will hand over the keys of a very special Model 567 Heritage to our biggest fan at a special ceremony at the Mid America Truck Show. We have the best and most loyal customers and fans in the industry, and I’m excited to see and hear their stories,” said Quinn.